I’ve met a lot of new people recently and so I thought it would be a good time to tell my game dev story, especially as a lot has happened in the last couple of years. I hope that you find it interesting! I started coding on the Spectrum 48K in 1984 when I was 9 (it came with a BASIC manual), and later I got a C64 on which I learned assembly language. I also programmed a lot on BBC Micro and Acorn Electron. Eventually I got an Amiga and did more assembly until one day I found out about Blitz Basic 2 which was brilliant because it was faster than AMOS and it enabled me to make games much more quickly than assembly. This was all a hobby but when I was 21 I got a job making business software in Delphi/SQL which I did for 9 years! It was bookshop stock control and accounting systems – pretty boring but it taught me a lot and I ended up as manager of the company and we installed systems all over the UK including parliament, which was neat. Eventually I quit and went indie in 2005 because I was working all day and coding games all night and it was making me ill. I was making a platformer at the time but I quit it and started making casual games (in BlitzMax) as they were doing well back then. It took me a couple of years before I hit my stride and programmed Fairway Solitaire for Big Fish Games. That did pretty well and eventually they hired me and moved my family (I have a wife, 2 boys and a cat) over to Vancouver where I worked for them for 2 years, mostly on a Facebook game. However, corporate life was not for me so I quit and went indie *again*, this time armed with more experience and some savings (unlike the first time, God, I was so naive) – luckily I kept my company, Grey Alien Games running the whole time and so I was able to pick up where I left off. I released Spring Bonus after 3 months of being indie, just 7 minutes after my non-compete expired. Whilst in Vancouver I co-founded Full Indie, an indie meetup group with well over 1000 members and monthly meetups with over 100 people and speakers etc. I also helped Klei Entertainment with Eets Munchies (to be released next year), and did some of my own stuff before we decided to move back to the UK in August this year (for many complicated reasons). So now I’m trying to meet up with people in the UK indie scene because there wasn’t much of one when I left 4 years ago. It’s clearly huge now which is fantastic. I’m just about to release Holiday Bonus GOLD, my 8th casual title, on iOS/PC/Mac and maybe Kindle, and I’m also porting Titan Attacks (by Puppy Games) to iOS using Monkey. I’ve also got some other things in the pipeline. Over the years I’ve made a bunch of free games and love doing game jams, and of course playing games. I also play the guitar, compose electronic music, and teach Aikido (been doing it for 15 years). I’m also an accomplished speaker (have spoken at PAX, Casual Connect, Universities, meetup groups, Toastmasters etc.) – so if you need a speaker or panelist, let me know! Holiday Bonus GOLD coming soon! Great News! Holiday Bonus GOLD is currently in development and will be launching this December on iPad, PC, Mac, and hopefully Kindle Fire. 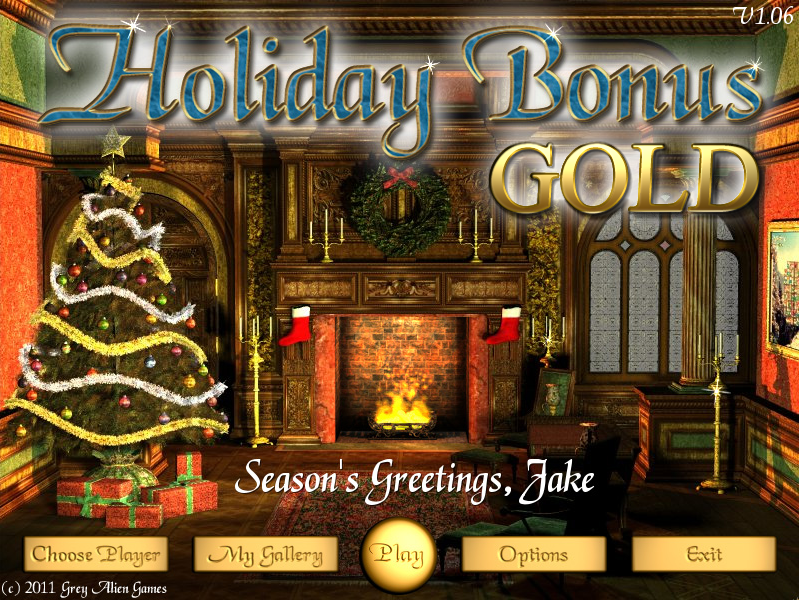 If you enjoyed the original Holiday Bonus then you’ll want to check out Holiday Bonus GOLD. It contains all the levels from the classic Holiday Bonus game plus 55 brand new levels. You can select which level pack you want to play on the Christmas tree screen. The PC/Mac version now also supports laptops with small screens as well as widescreen monitors. You can also disable the custom cursor and it has some improved graphics. The iPad version features sharper graphics than the original including higher resolution backgrounds, and sharper buttons and text. The game will be priced at $6.99 on PC/Mac and $4.99 on iPad. A festive bargain! Keep an eye out for it in the coming weeks. Posted in Grey Alien Games | Comments Off on Holiday Bonus GOLD coming soon! There’s not a whole lot to report since the last dev diary due to it being a bit of a slow week due to my son going into to hospital with a bad asthma attack. He’s fine now thankfully, and stocked up with medicines. As you can see from the screenshot above I’ve got a Titan Attacks project up and running in Monkey. I copied my Dying To Live project and have been modifying it and ripping stuff out, and of course it uses the same common framework, which I have been enhancing. 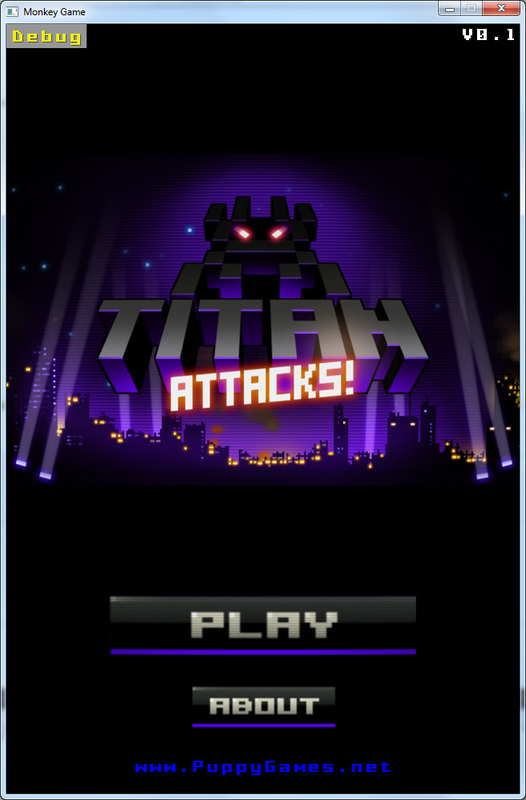 The above screenshot is just a test with a screengrab of the Titan Attacks main screen with a couple of buttons added – it’ll look a lot different when it’s finished. I also plugged in some music from the original game. This all helps me get into the vibe as I work on the project. I’ve been doing a lot of behind-the-scenes work on my framework’s GUI system so that I can easily create menus, buttons, labels etc. Also the game now detects the device resolution/aspect ratio and can position elements sensibly. There’s some more work to do on the front however. You can see a Debug button in the top left of the screenshot; this is to that I can display key information about the device and debug variables directly on the iPhone because of course I can’t press any special keys to show a debug panel! I’ll do what I said I’d do last time, which is prototyping the controls. Also I need to get the game to draw the GUI in a different layout on iPad. I’m having fun working on this. 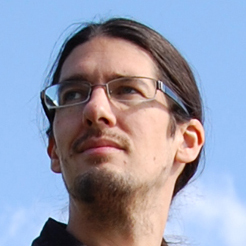 I love upgrading my framework – it’s like an RPG character I keep leveling up with new skills. You are currently browsing the Grey Alien Games weblog archives	for November, 2012.